I worked out after Open Gym yesterday. Unlike today, which is cold and rainy, yesterday was warm and sunny. I didn’t complete SDL 1RM, as I recently, you know, did that and all. This was as much fun as I thought it would be. My only goal was to work continuously, and continuously work I did. Time = 16:06. That’s 1.75 mile run and 70 burpees of pure wonderfulness. Jeff’s flight didn’t arrive until well after midnight last night, so I was operating on just 3 hours of sleep this morning. I coached from 6 until 10:30, judged Kelly-May and witnessed her, well, going far beyond what even I thought was imaginable. You want to know what happened? Yesterday she finally learned how to do double unders, albeit completing as 1 single and 1 double under. What she was able to do, though, was quickly complete double unders in this manner, i.e., alternating single unders and double unders. 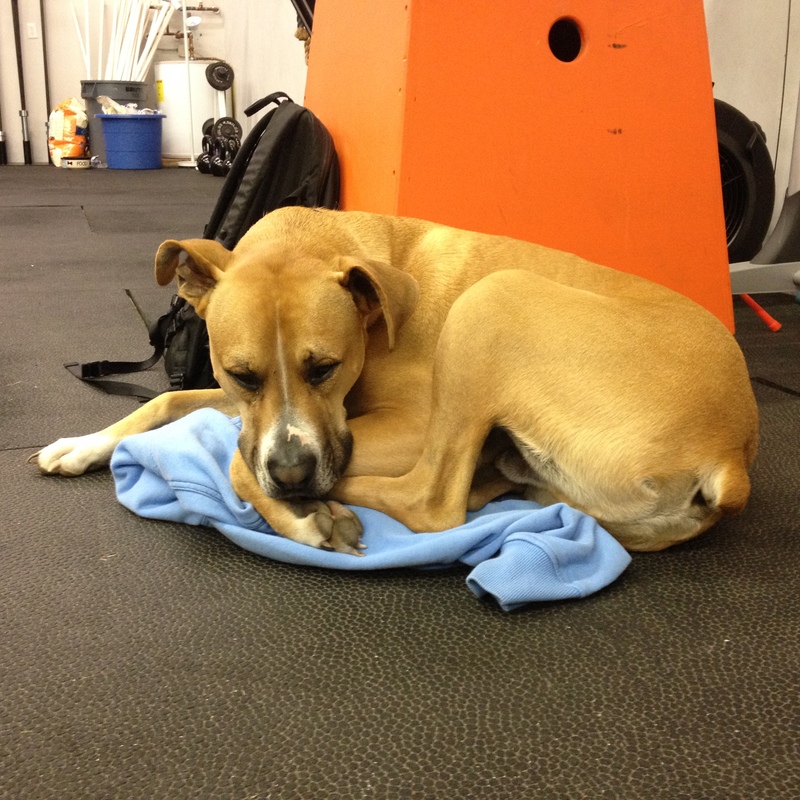 She crushed the power snatches and was just 4 reps shy of completing 5 rounds total. Wow! I was spellbound. Back to me. Yup, back to me. I’ve been wanted to attempt at new 1RM since I attended the Powerlifting seminar a couple of weeks ago. I partnered with Felicia, hoping that some of her mojo (moja?) would rub off on me. My goal was to achieve a new 1RM, and I achieved that goal. I completed 5 @ 95, 4 @ 115, 3 @ 145, 2 @ 165, @ 1 @ 185#. The last lift felt easy except for one very odd thing that occurred: I was pressing my feet so firmly into the floor that I felt a very slight twinge in my right hamstring. Given that I knew that I’d be next completing jumping lunges, I didn’t attempt another lift. Wow, this was tough, and I’m talking specifically about the alternating leg weighted jumping lunges. I completed 10 unbroken dead-hang pull-ups the first round, and completed another 5 in the remaining time. I then completed 11, 10, 9, 10, 8 (clock snafu and I think we had another 10 seconds to complete reps), & 10 for a total of 73 dead-hang pull-ups. That’s a f@cking lot of dead-hang pull-ups. I completed 20 lunges every round but the last. How many did I complete the last round? Twenty-four. That’s a total of 144 jumping lunges with 65# on my back. That’s a lot of f@cking lunges. I have no intention of competing in any kind of, you know, competition. Don’t even ask if that’s my goal, okay? Okay.